Why this kit? We just had a friend who said it was like buying brownie mix -- just add eggs and oil! That sort of describes what we were after here: to provide you with all the things for making a cute little project. Take your bag of stuff anywhere and you're ready to go. No shopping or hunting for things required. And if you need some help getting started, you can watch a video with Vickie Howell showing you how it comes together. And this amigurumi cactus comes together quickly! If you've got some basic crochet skills under your belt, the cactus can be completed in just a couple of hours. No crochet skills? No problem. With a little practice, you should be able to put this together (not a great project for the little's to start with, but teens proficient with a hook should be able to handle it). Your result? A darling little life size 6-inch cactus. Place it on a shelf, windowsill or mantle. Decorate a bedroom or a bookshelf. Mix this little cactus in with your existing real life collection of succulents and cacti. Bring it to work and have a maintenance free plant that cozies things up. No water required! Just a little love. Kit Includes: Printed Pattern, Terracotta Yarn, Earth Toned Yarn, Green Sparkle Textured Yarn, Crochet Hook F, Yarn Darner Needle, Plastic Canvas, Straw, Red Crocheted Flower and Poly Fiber Fill. BONUS: Packaged in a cute resealable bag that will keep your project organized as you work on it. EVERYTHING YOU NEED: And we mean everything! All the yarn, a crochet hook, a red crocheted flower to decorate your plant, a plastic canvas and a straw to make your pot stand upright, a needle, poly fiberfill stuffing, and printed instructions with photos. QUICK & EASY: This is an Amigurumi DIY Craft that comes together quickly. For those with basic crochet skills the cactus can be completed in just a couple of hours. No crochet skills? No problem. We supply a video tutorial link along with the printed and illustrated pattern so anyone can do it. Your result is a darling little life size 6-inch cactus. 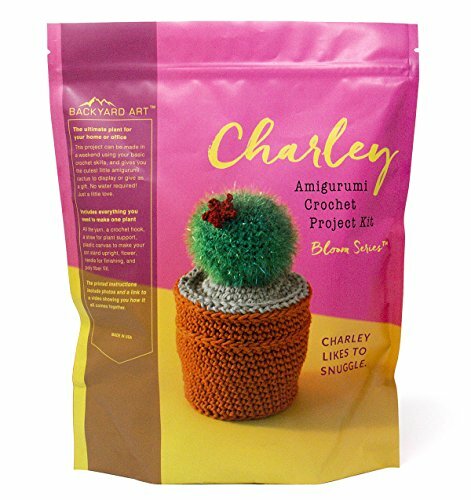 SO FUN TO DISPLAY: A crochet craft project that gives you the cutest little life size cactus for your home or office. Place it on a shelf, a windowsill or a mantle. Decorate a bedroom or a bookshelf. Bring it to work and have a maintenance free plant that cozies things up. Mix this little cactus in with your existing real life collection of succulents and cacti. No water required! Just a little love. PERFECT GIFT: Make one of these up for a unique handmade housewarming gift. Or give the kit to your favorite crochet fan or interested beginner. Collectible and fun! COMES IN ITS OWN STORAGE BAG: Packaged in a cute resealable bag that will keep your project organized as you work on it.